The leaves are falling from the trees and that means one thing: time for sweaters! Ok, two things. Wool sweaters, and wool festivals. 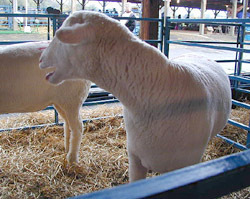 I recently went to the Common Ground Country Fair and the New York State Sheep and Wool Festival to check out this year's offerings. Common Ground is sponsored by the Maine Organic Farmers and Gardeners Association (MOFGA). It's always the third weekend after Labor Day, and has been taking place for 26 years. Recently, the Fair moved into a beautiful new year-round education facility in Unity, Maine, where MOFGA (the oldest and largest state organic organization in the country) can carry out its mission of helping farmers and gardeners in growing organic food and promoting environmentally sound farming practices. Fellow knitter Julie Falatko and I set off with a few friends and one common goal: fair food. After all, it's not a fair without fried things, right? Wrong. Not at Common Ground. Everything is obscenely healthy, from the eggplant and hummus wraps, to the no-added-sugar strawberry-lemon smoothie. This was not necessarily a bad thing. Suitably and organically fortified, I went off in search of knitting-related fun. The Wednesday Spinners presented a "Sheep to Shawl" to celebrate their 25th Fair. All weekend long, the Spinners did wool shearing, carding, dyeing, spinning, weaving and knitting demos for an extremely interested public. I was fortunate to catch a demo on dyeing with onion skins. Such gorgeous colors, and all from items I have at home! 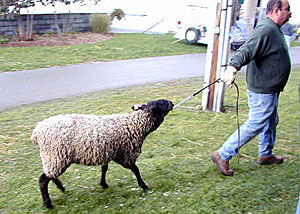 Nearby, a shepherd from New Hampshire was doing demonstrations with his sheep and border collies. Several of the dogs were rescued from abusive homes, and I was really impressed with the intelligence and obvious enjoyment they displayed in their work. I also wished my dachshund was as well-behaved! There are no pets allowed on the grounds of the Fair, but Julie spotted a stealth dachshund in one woman's shoulder bag. Joe Miller of Rivercroft Farm in Starks, Maine, where I bought my first spinning fleece, had a number of his sheep there for show, and we chatted for a while. Overall, lots of fun and a chance to learn more about alpacas and other fiber animals I wasn't familiar with beforehand. oh heck, what's the past tense for "You ain't seen nothing yet"? That's how I was feeling when I drove into Rhinebeck for the New York State Sheep and Wool Festival. The fest is usually called "Rhinebeck" by fiber enthusiasts, after the small village where it has been held the third weekend of October for the past 30 years. It's sponsored by the Dutchess County Sheep & Wool Grower's Association. my head is spinning just thinking about it again! Six hours flew by in an instant. Unlike Common Ground, where most of the exhibitors/vendors were from the Northeast, Rhinebeck featured artisans from across the country. If I were forced to choose between the two, I'd pick Rhinebeck any day. The wonder of Rhinebeck is both quantity and quality. You really have to budget more than one day to see everything, and the size of the town means you should make hotel reservations far in advance. The most interesting part for me was seeing how so many people with a common interest -- fiber -- found different ways to express their creative skills. There was soap made from goat's milk, buttons from Icelandic sheep horn, felted wool hats, and sheepskin rugs for sale. 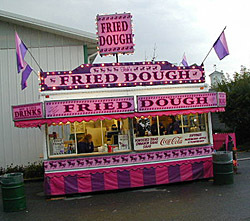 Oh, and the all-important fair food question? Good stuff. Strategically placed fried-dough vendors, a very-well-trafficked coffee stand (cold and rain created a pressing need for caffeine), and other tasty treats. Because Rhinebeck focuses just on fiber animals, there's an amazing array of rarer breeds than at the average county fair or Common Ground. It's great fun to learn about breeds you may have never even heard about, let alone seen. Rhinebeck is also a very friendly fair. I was wearing a handspun, handknit sweater I'd made and people would just walk up to me, ask if I'd made it and start talking. It was a great way to meet other handspinners and knitters, and provided a forum in which you could ask questions about techniques or methods used to create products you'd like to do yourself. If someone was selling handknits with a great "made-by" label, you could ask where he or she found them, or where they procured the fabulous buttons on their cardigan. Fiber fairs aren't just about commerce, they're about community. Shannon Okey is a knitter from Somerville, MA, who first discovered the Zen-like joys of knitting during stockbroker boot camp. Much to the relief of her artistic family, she left the world of finance and added spinning to her repertoire in 2002. Shannon maintains both knitting and personal websites when she's not chasing her miniature dachshund Anezka around the house. © 2002 Shannon Okey. Contact Shannon.